I haven't found a CMake module to find FFMPEG libraries, so I wrote one (a while back) and I thought to share it. It will look very hard in order to find it on *nix and Win all the same, and I found it useful. I wish to report of a number of tweaks and additions to the hand silhouette tracker I posted a while back. First is the ability for it to "snap" to the object using a simple Active Snake method, another is a more advanced resampling technique (the older tracker always resampled after every frame), and of a number of optimizations to increase the speed (tracker now runs at real-time on a single core). Continue reading "Extending the hand tracker with snakes and optimizations [w/ code, OpenCV]"
So animated gifs are awesome if you're writing a software blog. It saves all this time working with YouTube embeddings and stuff, and your "videos" are stored locally. The simplified FFMPEG writer was before unable to output animated GIFs, but I've tweaked it and now it does. 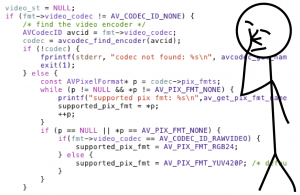 It's also a nice piece of code to learn how to FFMPEG in C.
Continue reading "FFMPEG video writer - now with animated GIF support [w/ code]"
I want to share a little snippet in case anyone is interested in writing video files from cpp context using FFMPEG, I've made it for usage with OpenFrameworks. It's basically a simple wrapper around the encoding mechanism of FFMPEG, so you can easily just say which file to write to and start dumping images into it. It will take care of choosing the codec, writing headers and trailers, encode (compress) the frames and write them to the file. Continue reading "Simplified FFMPEG video writer (also for OpenFramework) [w/ code]"